If you were injured in an accident and you are having trouble paying some bills you might need legal funding. Redwood Funding Group provides legal funding so that you can relax during the pendency of your lawsuit. Compare Redwood Funding Group’s rates on this website to any funder in the country. You will see how much you will save. No fees and No compound interest. We are the hottest funder in the country. Redwood Funding Group provides legal funding to individuals who are victims of accidents. Those accidents can be car accident, slip and fall accidents or construction site accidents. As long as you have an attorney and were in an accident Redwood Funding Group can help you. First of all, the difference between legal finance and a bank loan is the following: when you get a bank loan you must pay it back under every circumstance. Conversely, when you receive legal funding from Redwood Funding Group you only pay it back if you win. If you lose you owe Redwood Funding Group nothing. Therefore, if you are considering getting legal funding you should be educated about the business. Consequently, what some do in this business, you may not be happy about.. Hence, you should then compare any legal funding offer what Redwood Funding Group. Our competitors advertise interest rates of 3-4%. That sounds great. But what they don’t tell you is they mean 3-4% monthly compounded. That’s about 65-85% a year! That’s double in 18 months or even less. A Redwood Funding you would be paying less than half. Need an example? no problem. If you borrow $1,000 from a competitor they will charge you a fee. That fee can be $200. Most noteworthy, is that they take that fee and add it to the principal you are borrowing. So you owe interest on $1,200. Furthermore, your interest grows every day or every month. So that little 3% number really means about $3,000 after 18 months. Often more than that. Want to know what you would pay Redwood Funding Group after 18 months? $1,450. Also relevant, if you want to receive your money by Federal Express or by bank wire they might charge you $50-$100 extra just to process the delivery of your legal finance. 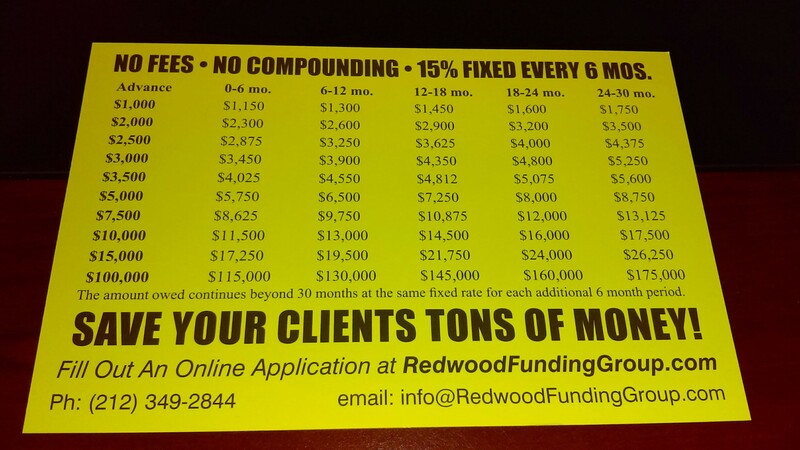 At Redwood Funding Group we never charge fees in any form, ever. We also never compound the interest rate, ever. We have one fixed rate for any amount of money that you borrow. You pay 15% of the principal amount for each six months that you have our legal funding. Finally, if you want your money by Federal Express or bank wire, we only charge you what our bank or Federal express charges us and we give you the receipt to prove it!